This piece was meant as an Appendix to the first part, but eventually it grew so large I decided to post it on its own. When we the people have a conversation, we often disagree with each other. When that happens we often say “You are wrong”. When we say “You're wrong” in everyday life, we mean “The way I think is different from the way you think and because I think I am correct that makes you wrong” (meaning, “I will not act the way you suggest, I will act the way I want to act. Unless you are stronger than I and can force me. In that case, I will act the way you suggest, but I still will be disagreeing with you”). Scientists are people to. When they have a scientific discussion, sometimes they forget that they're scientists and act like regular people. However, in science term “wrong” has a very different and very specific meaning. When two scientists have two different views on the same phenomenon it doesn't necessarily mean that one of those scientists is correct and another of those scientists is wrong. It can be that they both are wrong. Or in a weird scientific way it also can be that they both are correct. The latter would mean that they both are not-wrong (at least so far), meaning that there is no yet a way to make a conclusion on who is wrong and who is not. So, what does it mean “to be wrong” in science? The first meaning “to be wrong” is making a statement which contradicts direct observations; it means, there is an experiment which demonstrates that a statement is wrong. The second meaning “to be wrong” is “this statement violates rules of logic” (including making is mathematical mistake). And when I say “a statement” it doesn't mean just the final statement; it means the whole text which includes premises, logical reasoning, and the final conclusion. This is when scientists may start acting like regular people; they say “your logic is wrong” but they mean “your logic is different from mine hence you are wrong”. In science, though, statement “your logic is different from mine, hence you are wrong” also may be wrong. Every scientific statement begins from certain premises. In science those premises might be called axioms, or fundamental/first principles. Basically, those premises are beliefs and cannot be proved by being logically derived from anything else (that is why they are fundamental; if they could have been logically derived from other statements, those statements would have been fundamental). When two scientists differ on the premises there is simply no logical reasoning which could reconcile their views (here again Max Plank’s statement comes to mind). They will have to wait until experiments will tell them who is right (or until death). If both scientists agree on the axioms (but still disagree on the conclusions), next step is checking the logical reasoning which leads from the premises to the final conclusion, to make sure there are no logical mistakes, no internal contradictions, omissions, or inconsistencies. When one scientist finds a logical mistake or an internal contradiction in the reasoning of another scientist, then he or she says: “You are wrong. You are wrong right here. This is why you are wrong. You made this mistake”. But – it is very important to stress – it doesn't mean “You're wrong because your logic contradicts my logic”; it means “You are wrong because your logic is flawed (due to logical mistakes, internal contradictions, omissions, or inconsistencies)”. There is, of course, the final, the ultimate ending of a discussion: "I can't prove your are wrong. I can't prove I am right. I don't want to discuss my axioms. But I disagree with you anyway become I don't want to agree with you." After publishing my pieces on quantum mechanics (first, “Killing The Cat” and then this one) I've got some emails from people who said that I was wrong. However, so far, the meaning of word “wrong” they used was its everyday regular meaning, i.e. “Your logic is different from mine”. Basically, what they said was: “You say this, but I believe in that because there are other people who also say what I say”. Well, that is not the way science works. To prove that I'm wrong my critics should either demonstrate that my statements contradict experiments, or that my statements are logically inconsistent. The former is impossible because I do not deny the Schrödinger’s equation, I completely agree that it leads to correct experimental results. And the latter so far is absent. One common theme of critique to both pieces (“Killing the Cat” and this one) is that Richard Feynman’s path integral approach gives the correct description of the quantum particles behavior, hence his interpretation of behavior of quantum objects is also correct. This critique is based on a misunderstanding of the relationship between heuristics or plausible reasoning which had led to the development of a specific mathematical model, and the mathematical model. Heuristics or plausible thinking does not represent a logical proof of the mathematical model which was derived based on that heuristics or plausible thinking; the proof of the correctness of a mathematical model lies in the fact that it leads to measurable results which agree with experiments (fulfilling the mission of science). When Niels Bohr was imagining a hydrogen atom in the form of a Solar System it helped him to arrive at the correct values of the energy levels of a Hydrogen atom. But today every scientist knows that a hydrogen atom doesn't look like a Solar System at all. When Richard Feynman was imagining electrons traveling through all possible paths simultaneously it led him to arrive at the mathematical description of quantum mechanics in the form of specific mathematical objects (path integrals). His mathematical method works very well. However, it doesn't mean that electrons actually travel through all possible paths simultaneously. That view represents only an interpretation, or better say, visualization of possible behavior of an electron. This discussion, though, helps us to demonstrates the most important difference between classical world and quantum world, between classical mechanics and quantum mechanics. There is a device named “Bell distribution visualizer”. This is how it looks like (two very similar examples; there are also multiple apps which can do the same). It has a spout to drop balls through, a board with pegs, and channels to collect falling/rolling balls. When a ball drops through a spout, its trajectory through the board is unpredictable, and it can end up reaching any channel. For each trajectory which begins at point A and ends at point B (for example), there is a probability that a ball will travel exactly along that trajectory. To calculate that probability, we need to multiply probabilities for the ball to get from one gap between two pegs to the next gap between the pegs along the trajectory. 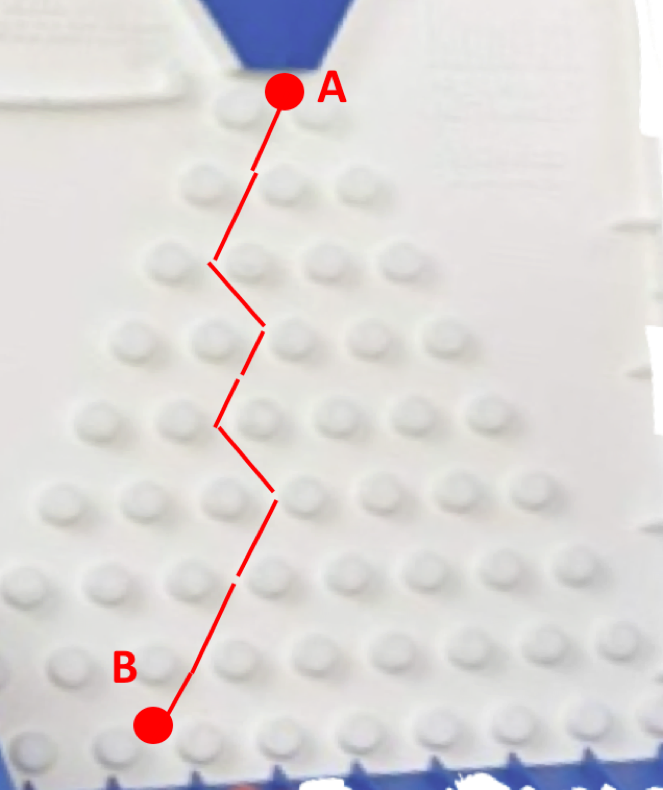 To calculate the total probability to get from point A to point B we need to add probabilities for all trajectories leading from point A to point B. This description has been well-known for at least a couple of hundreds of years and is simply based on the definition of the probability of an event. 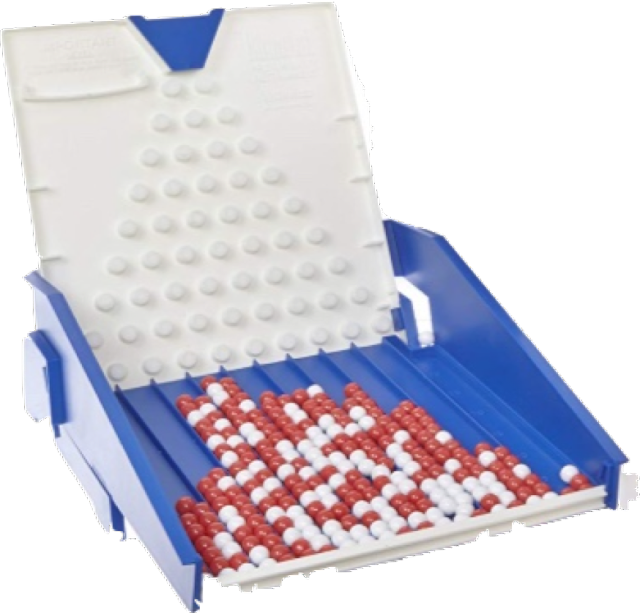 The simplest way to illustrate the rule is by applying it a small number of pegs, i.e. to short trajectories, for example when there are only three rows of pegs. There is a fifty- fifty chance for a ball to get from point A to points B or C.
There is a fifty- fifty chance for a ball to get from point B to points D or E.
There is a fifty- fifty chance for a ball to get from point C to points E or F.
Hence, the probability for a ball to end up at point D is equal to the probability of the ball to get from point A to point B and then multiplied by the probability of the ball to get from point B to point D; which is 0.5*0.5=0.25. The probability for a ball to end up at point F is also equal to 0.25 (it is equal to the probability of the ball to get from point A to point C and then multiplied by the probability of the ball to get from point C to point F). But to get from point A to point E a ball has two possible trajectories, i.e. A-B-E or A-C-E. Hence the probability of a ball to end up at point E is equal to 0.5*0.5 + 0.5*0.5 = 0.5. The probability of a ball to end up somewhere is, of course, equal to one; 0.25 + 0.25 + 0.5 = 1. As we already mentioned, this analysis is solely based on the definition of the probability of an event (of course, you can look it up on the internet), and the definition of the probability of an event is solely based on our ability to count, simple arithmetic, and common sense. As the result, when many balls run through a board, they reach different channels with different probability; and the channel which has a higher probability to be reached accumulates more balls in it (hence the photographs). The distribution of balls in channels is shaped like a bell, that is why it is commonly called “the bell distribution”. With a rather sophisticated equipment, instead of balls we could use electrons. The fact of the matter, that if instead of balls we would use electrons, the distribution would be different. In a classical (pun intended) electron diffraction experiment we can see that some locations on a screen (would be “channels” in our ball experiment) would be restricted for electrons, electrons would not be able to reach those places. For big, classical balls, there are no restrictions on what locations they could reach. For quantum particles, there are restrictions. Once again – no one knows. People invented a name for that - "wave-function interference", but giving something a name is not an explanation (it lowers the level of anxiety, though). Richard Feynman created a mathematical apparatus which turned out to be very effective, especially for quantum fields theories. When he was developing his mathematical apparatus, he was imagining an electron traveling simultaneously along all possible trajectories. There is no sane person in the whole world who would say that a single ball traveling through a board with pegs travels through all possible trajectories simultaneously. Why? Because everyone with eyes would see that it is not a case and would call that person insane, or a liar, or a clown. But no one can see electrons. Hence, people can believe in anything they want to, as long as it makes sense for them and does not contradict experiments. That belief is an interpretation. And when there are several interpretations, there is usually one which dominates the field (because it is easier to imagine, or less controversial, more controversial, beautiful and exciting, or supported by the figures of authority in the field, or else). The picture created by Feynman was beautiful and clear. An electron can travel along all trajectories at the same time (how - who cares! why - who cares! it's an electron, not a ball, so - why not?). For each possible trajectory, Feynman could calculate the probability of an electron traveling along that trajectory. However, if he would need to calculate the probability of an electron to travel from point A to point B by adding probabilities for each possible trajectory (like we did it for a ball), the result would have been wrong (contradict to the results of multiple experiments). The genius of Richard Feynman was that after thinking, and rethinking, and thinking again he discovered, that if instead of adding probabilities he would be adding so called amplitudes (mathematically related to probabilities in a simple way), he would get the correct result. He knew that because – when he did that – he basically ended up having the Schrödinger’s equation, which at that time was very-well known and proven to work right. However, logically, it does not mean that the mental picture used for arriving at that method is automatically correct. We could believe that this picture is correct, but we should keep in mind that that would be only our belief. I do not believe in that picture simply because I do not see it necessary. Instead of making things clearer, it complicates things. Yes, an individual electron can travel in space via different locations; we could draw for an electron all possible trajectories calculate the amplitude for each, and then use the result to find the probability for an electron getting from A to B. But we don't have to think that an electron has to travel through all trajectories at the same - in that an electron is not much different from a ball: one ball/electron = one path; many balls/electrons = many paths (maybe even so complicated and unusual that we would not call them "trajectories" any more? maybe the fact that at a given time an electron exists at a given location does not require that an electron would have a trajectory - in the sense we use this term in classical physics?). So, what is wrong with imagining electrons traveling through all possible trajectories simultaneously? Nothing, except we don't need to do it; that mental feature may have been helpful at a time, but now it does not really add anything important. Balls just do not have amplitudes, but electrons do. Those mysterious “amplitudes” which have to be used for calculating final probabilities are closely related to wave-functions. And so far, no scientist (to my best knowledge) can explain why when we need to calculate probabilities for quantum events/objects, first we need to find wave-functions (or amplitudes), and then use them for calculating probabilities. And this is the biggest, the strangest, the real mystery of quantum mechanics (at least for me). Richard Feynman was a genius also because he invented a method to visualize complicated calculations, and that significantly lowered the difficulty of mental operations required for carrying out such calculations (like an invention of an excavator for trench diggers). After mentioning that fact (sorry in advance for double negative) I just cannot not to pock - again - people in the field of artificial intelligence. I can bet a million dollars that within ten years from now there still will be no developed artificial intelligence system such that could match the creativity of Richard Feynman. For anyone who may be interested in - why, I would recommend to start from reading "Relax! The real AI is not coming any soon!". Feynman was fine with his interpretation (naturally). And everyone who seeks a different interpretation needs to be strong enough to go against Feynman (or his spirit). The majority of scientists is divided into two large groups. People in one group don't even know that quantum mechanics has some internal difficulties. Nothing is rotten in the state of Denmark. And BTW: if everything is fine, why spend money on research, offer promotions, tenure? People in another group prefer pretending that everything is fine; they know it is not, but they have no intention to do anything about it (this is not going to help getting money on the research, promotions, tenure). First, I would like to offer a problem to solve to everyone who consider himself/herself a physics: "A tennis ball is released 5 m from above the ground. At the moment when the ball hits the ground what will its spin?". "A tennis ball is released 5 m from above the ground. Solve the Schrödinger's equation for the ball and find its wave function for t > 0". When presented with such problems a physicists would say that those problems do not make any sense. For example, a spin is a specifically quantum variable and only quantum objects can be described using that variable. In principle, the Schrödinger's equation should be ably to be applied to any objects, including all macroscopic, i.e. classical, objects, like a tennis ball, but no one would do that. In fact physicists do not even know for sure how to do that (that is what decoherence theory tries to understand). the behavior of microscopic objects- it is wrong! For me, when a system involves subjects which state depends on their reasoning, that system simply does not belong to the realm of physics. I don’t know if the argument can be made internally consistent without using intelligent species who have to reason about the processes possibly happening in the system, but I think that without this type of a formulation the argument remains wrong, or at least undefendable. For example, statement like “observer, called agent F, measures the vertical polarisation z of a spin one-half particle S” should be replaced with something like “a classical measuring device D which can have only two states which depends on the vertical polarisation z of a spin one-half particle S"; and "when device D is brought to state A it means a spin of a particle contacting the device z = -0.5, when device D is brought to state B it means a spin of a particle contacting the device z = 0.5"; and etc. for all other statements related to any “agent”. One of the issues confusing many arguments about quantum mechanics is that they intrinsically include "an observer" who reasons. If (and often it is a big IF) "reasoning" is just a figure of speech and just describes possible correlations between the states of a quantum system and the states of a classical system (a measuring device), why just don't completely eliminate that confusing language once and for all? If reasoning is an actual thinking - that's not physics any more. Someone can ask: "Why?". The simple answer is because every experiment involving at least one quantum object must (at least for now) be described in terms of probability amplitudes of specific events. There is no probability amplitude for "thinking, or "reasoning" (at least in physics). As "an observer" a scientist who is a part of an experiment can do only one thing - register states of other classical systems. But he cannot think. Thinking is not a part of any physical law, not classical, not quantum. The only observer/thinker who can think is the who reads the paper (i.e. the one who makes an interpretation of all the data provided by the measuring devices - classical objects/systems). The fact that logical paradoxes exist does not make formal logic wrong. The fact that a paper uses scientific terminology does not make it yet scientific. I would like to stress again that if a system includes "a reasoning device" (a.k.a. observer), this system does not belong to physics. If term "observer" ("agent", etc.) only represents "a registering device" (a.k.a. "measuring device"), there is no reason to keep that term at all. Maybe this particular paper would have no logical inconsistencies left after all "observers"/"thinkers"/"reasoners" would have been replaced with just measuring devices which can have a specific set of states, or maybe not, it is the responsibility of the authors to make that check. A scientific paper cannot have any ambiguity. Term “observer” brings that ambiguity. Some time ago the editors of all scientific magazines stopped accepting papers on the development of a Perpetuum Mobile. It is a time for editors to stop accepting papers on quantum mechanics which describe an observer as an intrinsic part of a quantum system. And for the scientific community - there is simply no reason for paying any attention to such papers. And now, after all the logic about the role of an "observer" the final nail in the coffin. When describing the though experiment authors write, quote: "Agent W could instead model agent F's lab as a big quantum system". Right here we find the reason for this whole article being wrong. There is no such thing as "a big quantum system". A system is either quantum, hence microscopic and can be described by the quantum theory - in its current state. the system is big, hence macroscopic, and CANNOT be described by the quantum theory - in its current state. Remember two problems about a tennis ball? Now you know the reason we talked about them in the beginning.P.S. What I am kind of also curios about is how would we explained the way magnetic field acts on an electron - but using QED? I mean, Stern-Gerlach experiment treats magnetic field classically. But we all know that in quantum reality we have to use photons. So, when an electron is traveling through a magnetic field it is being bombarded by photons. An electron has a spin, and photons are polarized, so it is not just the standard Compton effect. And one collisions should not be enough to make the beam of electrons split in "+" and "-" z-components.If we consider only an individual collision between one electron and one photon, how does an electron "know" in which direction is the magnetic field; how does an electron "know" that there is a magnetic field - for an electron there is only one photon which collides with it? This is not the first time a physicist designs an experiment involving light traveling through different devices. Light in a form of a wave or a photon encounters a mirror or a half-silvered mirror, or even two devices, and then analyze what may happen. When I read about such an experiment I always ask the same question, why does the scientist think that the photon that travels after interacting with a device is the same photon which was traveling before? This is not true, and may – or may not, no one knows – lead to gross misinterpretation of the experiment. A device is composed of a huge number of charged particles, and that photon which encounters the device is interacting with some of them, and that interaction has to be described – in general – by QED. Eliminating this interaction and replacing it with “the photon will take either path 1 or path 2, and then go on to hit either detector D1 or D2 with equal probability.” is just wrong. Saying that "a single photon is reflected by a mirror" is not much different from saying "Mars population of unicorns doubled". A single photon simply cannot be reflected by a mirror; reflection is a macroscopic phenomenon describing the result of an interaction between a wave and a matter; or between a large number of photons and a matter. A single photon can only interact with matter, be absorbed, and then a new photon is released. 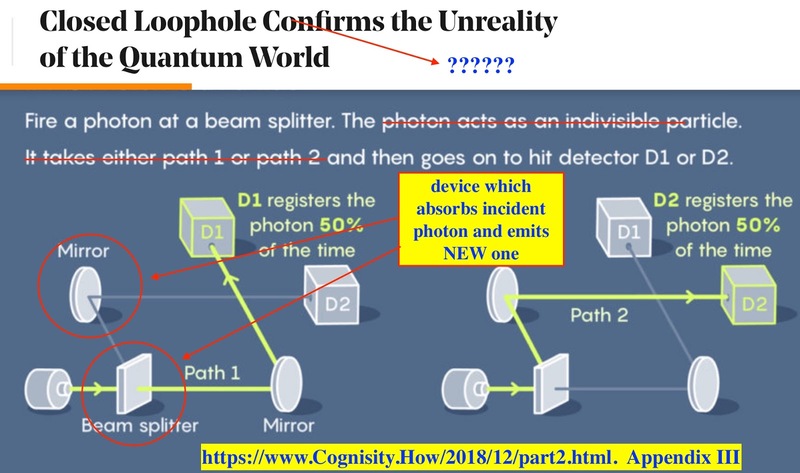 The new photon does not have to "carry the torch" of the first photon; there is not reason to expect the photon leaving the device (mirror, splitter) must behave in exactly same way as a hypothetical reflected/transmitted photon would behave. 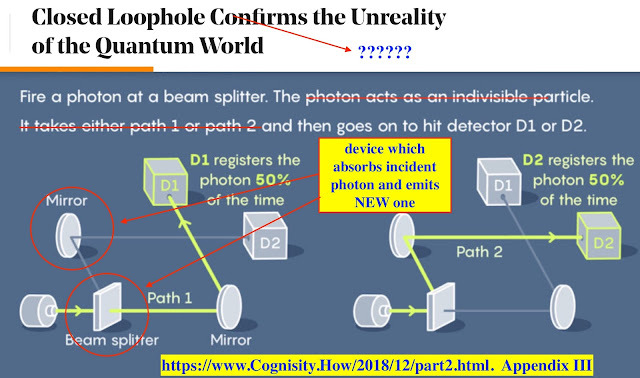 The direction of the new photon does not have to obey the law of reflection; only on average, when many photons absorbed and released the wave traveling away from the material object called a "mirror" will be described by the law of reflection. A photon is an indivisible whole, by a definition, a photon is a light particle (saying "a photon is a wave" is like saying "a water molecule is an ocean"; a light wave is a composition of a huge number of photons). A photon interacts with charges in device, and those processes may lead to an absorption of the original photon, emitting of another photon, which can be absorbed again, etc., etc. And BTW, those interactions take time, they follow laws of quantum mechanics, hence has that time should have random values, which may break any expected interference/coherence. One cannot treat a photon-mirror interaction as classical and make any statements on the quantum nature of the phenomenon. The whole idea behind the experiment with a single photon becomes just flawed. If an experiment assumes using laser beams, that automatically assumes the use of large number of photons, hence, light can and should be treated as a wave - automatically. BTW: it means that experiments designed to study entanglement using photon are wrong. Not the idea of entanglement - that remains to be investigated. But the experiments based on photon interference, because the photons which interfere in the end are not the same photon which are prepared in the beginning, and there is no clear connection between those photons (at last, to my best knowledge). The majority of my ideas come to me while I am in traffic or in a swimming pool. During a day there is not much time to formalize them in a fashionable way. This blog is the best I can do (so far, let's wait for retirement). The idea for this Appendix came in traffic, and for the next one - in a swimming pool. After a ninety-year long discussion, physics community still have no commonly accepted understanding of the origins of quantum mechanics and keep searching for those. Some experiments (at least thought experiments) which try to demonstrate inconsistency or internal contradictions in quantum mechanics are being discussed on a regular basis. This means that all the hype about quantum computing so far is, well, just hype. Kind of a scientific way of money laundering. Cool! Exciting! Yes - promising (no one knows yet exactly what?). But so far - a hype (exactly like AI). I am not a physicists, so why am I so confident in my assertions? Well, I have taken all the same course physics PhD candidates take in the U.S. (checked). But I also had to take additional philosophy courses, because every university student in Russia had to take (plus a philosophy course required for PhD students). Many students hated those course, but I liked. And after my graduation I kept reading a lot professional and popular literature on the origins of science in general and quantum mechanics in particular. On the top of that, I had be able to develop so deep understanding of the matter so I could explain it extremely clear to my student (which is reflected in my student evaluations). I’ve asked this question before, but I want to repeat it again, because from my point of view this is the most fascinating problem of quantum physic: why does the universe needs amplitudes? What do quantum particles have what classical don't? What do quantum particles lose when they become classical? Of course, the can't become classical by growing up. The become classical by joining together. When more and more quantum particle join together and form a large classical object, it seems they lose something. It kind of contradicts the laws of large systems called "synergy": properties of system are richer, broader than the sum of the properties of its parts. But quantum particles seem having no synergy. Or, we are missing something very important about them. I believe that the answers to these questions will automatically remove all other remaining question about the origins of quantum mechanics. How would we approach the answer to this fascinating question? We know that there is (kind of) a way to “derive” Newton’s laws from quantum mechanics. That means, if we would use a similar approach, equation (5) should eventually transform in equation (4). But what we are looking for is for clues, which could lead us from equation (4) to equating (5). For example, we could imagine that probabilities P also depend on some “hidden” variables and equation (4) is the result of taking the sum over all those variables. The “actual” equation should be in some other form, like (5). 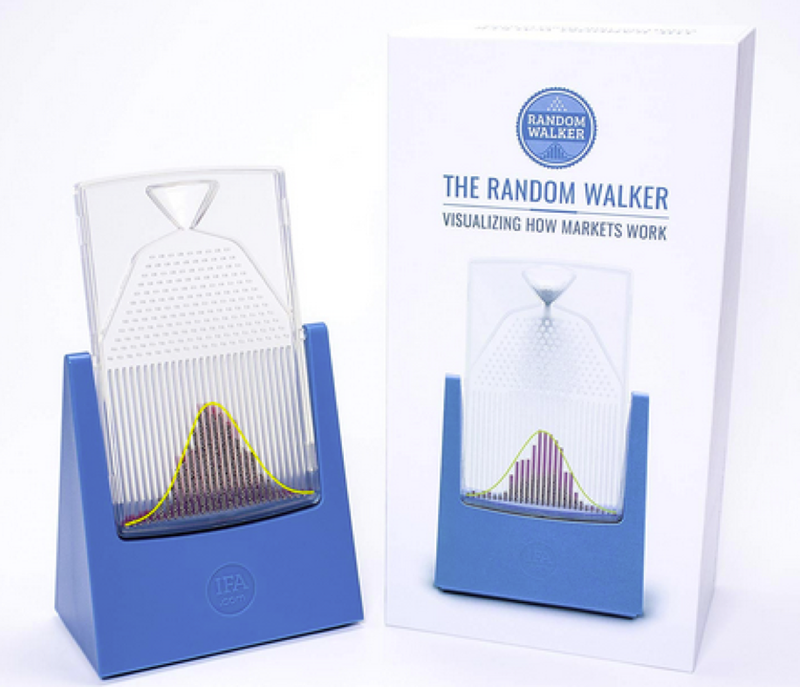 This idea my lead us to searching for some type of more general definition of “probability”, beyond the standard definition based on counting events. It also may lead us to take a new look at the classical examples which are commonly used to understand how probability works, and trying to find new views on those examples. One of such classical examples is running a die. When it stops, it has only one of the six possible states. Here I would like to pause for a moment to have a short discussion about the meaning of this term “state”, because lots of confusion comes from using this term and implying many different meanings. There is a statement we can make about anything in the universe; we can make the statement about everything in the world; about any object, about any system. everything in the universe exists and evolves. This statement, however, represents an axiom, a basic fundamental principle; basically, it is a belief; we believe that everything in the world exists and evolves. Of course, the statement is a result of a long practice, which includes many experiments, discussions, long and deliberate thought process, but in the end this statement cannot be logically derived from any other statements. If it could have been possible to derive this statement from other statements, than those other statements would have been axioms and basic fundamental principles. The fact that something exists comes from the realization that that object or system is not alone; it is different from something else that surrounds us. To describe that difference, we start searching for various attributes of this object or system which would allow us to differentiate it from other objects or systems. A set of such attributes allows us to describe properties of an object which are usually described by a set of variables or parameters or quantities to which we may be able to assign some numerical values. The examples of those parameters are mass or charge. Objects or systems evolve. Evolving means they change, the become different from themselves. To describe those changes, to describe that evolution were also search for some attributes, which can be described via a set of parameters. When we select that set of parameters we say – we can describe the state of an object or a system. When we say “state”, we mean parameters which we use to describe how system changes, how it becomes different from itself. And usually, we do all we can to minimize the set of such parameters, and if we have other parameters we use to describe the existence or the evolution of a system, those parameters usually can be described in terms of the parameters we use to state the state of a system (pun intended). For a classical point-like object the state is given by six variables. 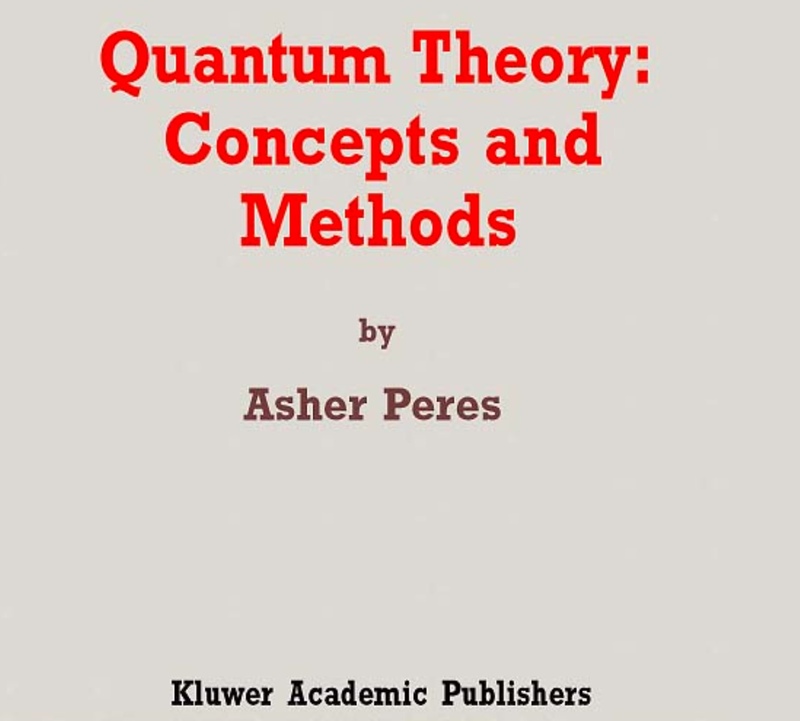 For a quantum point-like object a common definition of a states is via a wave-function. However, from my point of view, the jump coordinates and components of velocity to a wave function is too large. That is why I define as a state of a quantum particle its three coordinates. When a classical particle evolves, we study the evolution of six variables. When a quantum particle evolves, we study the evolution of three variables. There should be a way to reconcile those two evolutions (which is my belief). But we need to study a such classical particle that exhibit behavior some kind of similar to a quantum particle. That is why a die attracts my attention. Before it reaches the final resting state, it evolves in a complicated unpredictable manner. We could try to develop the exact description of that behavior (at least in principle) and see if it gives any hints on a similar unpredictable behavior of quantum particles. First, we need to introduce a variable which describes the state of a die during the process leading to the final state, which is a die with a specific number on its top face. We can imagine a vector inserted inside a die, which moves with it. In the final state this vector may point up, down, or be horizontal. When it is horizontal, we still cannot make a statement about the final state. To do that we have to add two more vectors; basically, we need to describe a die as a rigid body with a Cartesian reference frame inserted in it (no surprise here! A die is a rigid body). We should write the Newton’s law for a die; solve it for the parameters describing its evolution/motion (transnational plus rotational), but in the end, we need to strip off all the information except z-components of each vector we stuck in a die (the one and only, the beloved "function collapse"). 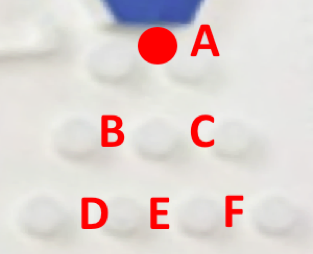 One of those components will not be equal to zero, and will be either positive or negative, and that will tell us what number will the die have on its top face. The problem is that when a die rolls the forces acting on it are unpredictable, random. That means, we have to apply a stochastic method for analyzing the evolution of a die. A stochastic interpretation of quantum mechanics exists. One of the proponents of the interpretation is Prof. Lee Smolin, whose book “Troubles With The Physics” I love. However, I hope that the pressure on the existing approaches (hidden variables, decoherence) would bring more attention to his (and other proponents of stochastic) work.